the nytpicker: Didn't Rod Blagojevich Help End Chicago Factory Sit-In? Maybe The Times Just Forgot. Didn't Rod Blagojevich Help End Chicago Factory Sit-In? Maybe The Times Just Forgot. As of last Monday, the Times was reporting that Illinois Gov. Rod Blagojevich was on the labor movement's front lines in the sit-in by laid-off Chicago factory workers that ultimately led them to victory. But after Wednesday -- when Blagojevich became an overnight national disgrace, synonymous with greed and corruption -- Times reporters chose to forget Blagojevich's actions on behalf of those workers at Republic Windows and Doors, which closed the factory on December 2 and offered no severance packages to employees. In multiple Times stories reporting on the resolution of the labor battle, the impact of Blagojevich's efforts has not been addressed. The labor-management conflict quickly became a national symbol this week of the pain felt by working-class Americans at the hand of corporate America as companies tighten their belts. Gov. Rod R. Blagojevich, who met with the workers Monday morning, said the State of Illinois was suspending its business with the Bank of America, Republic Windows’ lenders, and that the Illinois Department of Labor was poised to file a complaint over the plant closing if need be. Political leaders on the Chicago City Council and in Cook County threatened similar actions. Representative Luis V. Gutierrez said he was encouraging the Department of Labor and the Department of Justice to investigate. “Families are already struggling to keep afloat,” Mr. Blagojevich said. At that point, the Governor's actions seemed significant -- and a likely push towards a resolution of the conflict. The sit-in ended Wednesday night after Bank of America officials began negotiating with the company late Monday afternoon, shortly after Blagojevich made his move. On Tuesday, the day after Blagojevich's suspension of state business withe Bank of America, the institution agreed to lend the company $1,35 million to help pay for the 60-day severance the workers demanded to end the sit-in. Neither [union organizer Leah Fried] nor the workers would comment on the federal corruption charges brought Tuesday against the governor of Illinois, Rod R. Blagojevich, who met with the workers Monday and, in a show of solidarity, said the state was suspending its business with the Bank of America. 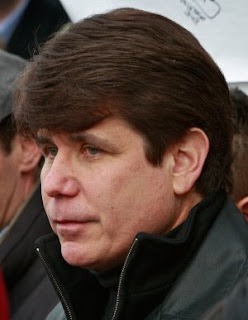 Were the loan agreements the direct result of Blagojevich's actions on Monday? It seems likely that a state government's suspension of business with a bank would influence its actions. But in the Times's reconstruction of the factory sit-in this morning, reporters Michael Luo and Karen Ann Cullotta devote 1,492 words to the conflict with no mention of the Governor's efforts on Monday to bring pressure on the company's lenders. It's as though Blagojevich did nothing. But history -- or at least in the first draft of history. as reported by the Times before the scandal broke on Tuesday -- will record that last Monday, the corrupt Governor of Illinois stood up to the Bank of America on behalf of working-class citizens who needed his support, and with the muscle of government power behind him. It's not enough to wipe out the horror of Blagojevich's actions on his own behalf, of course. But it's wrong of the Times to now pretend it didn't help.